In a few days from now, you will elect your representative to the Parliament. As you decide whom to vote for, I appeal to you to make sure that you elect an MP who will attend sessions, raise legitimate issues, and represent you best in Parliament. 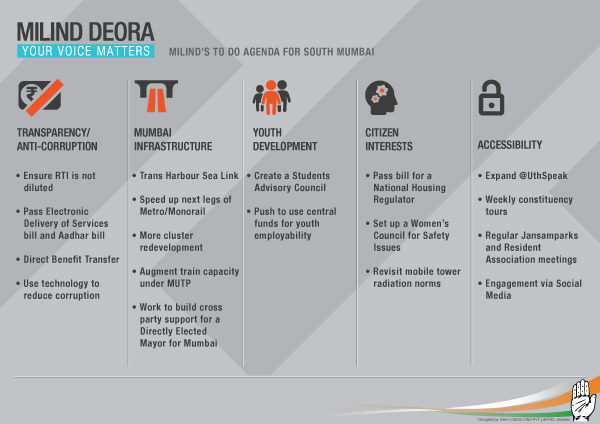 Your MP should possess the credibility, network, and resources to bring benefits to South Mumbai and the country. Over my decade-long political career, I have represented South Mumbai with dignity and decorum in Parliament. During my last term, I raised 274 questions, more than double the national average, and clocked an attendance of 88%. I have taken principled stands when it comes to important issues. In opposing my own government’s ordinance to protect convicted MPs I took a step that, I believe, will be instrumental in cleansing Parliament for future generations. At the onset of my political career, I was proud to initiate the debate on the landmark Right to Information bill that has since transformed access to public information in India, changing the very nature of our democracy and making it much more participatory. Thank you for placing your trust in me. I look forward to the opportunity to serve you again. Please make sure to VOTE along with all voting members of your family on 24 April 2014. Remember: YOUR VOICE MATTERS.